The use of water treadmills is in the spotlight as researchers investigate how they are used for the training and rehabilitation of horses. Water treadmill exercise has been increasingly used over the past decade as part of training for competition horses and for rehabilitation, often of horses recovering from back pain. Concerns about inappropriate water treadmill use prompted research by staff at University Centre Hartpury in collaboration with the Animal Health Trust. The findings, which have been published in Journal of Equine Veterinary Science, confirm that much more study is needed to inform vets and owners as to the most effective way to use water treadmills. 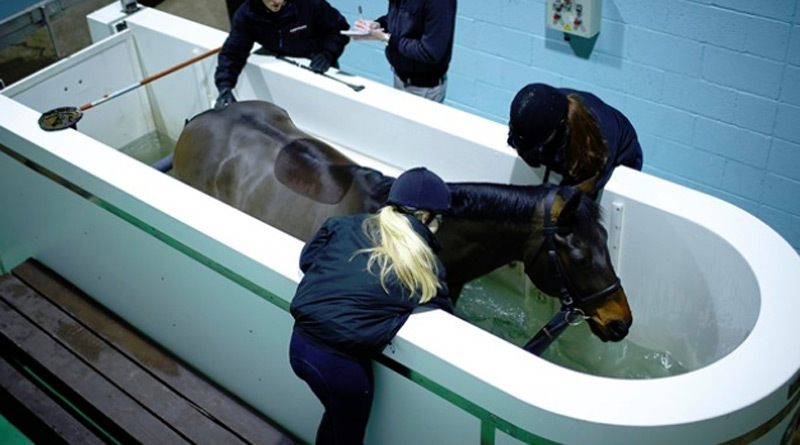 Previously, Dr Kathryn Nankervis, Principal Lecturer in Equine Therapy at Hartpury, and her team investigated how the depth of the water modified back kinematics in horses walking on a water treadmill. Researchers based at the Equine Therapy Centre at Hartpury investigated four water depths: Hoof, fetlock, hock and stifle. Dr Kathryn Nankervis, Principal Lecturer in Equine Therapy at Hartpury. According to the research at Hartpury, water around hock depth generates the most effective results in terms of promoting flexion of the back and less marked thoracic extension. “We tracked markers on the back with pro-reflex cameras to figure out the maximum extension and maximum flexion of different regions on the back and then used the difference between these two values to figure out the total flexion extension range of movement,” Nankervis said. “As expected, we found the total flexion extension range of movement of the thoracolumbar spine increased with water depth, but how the increase came about is different in the thoracic and lumbar regions. “As water depth increased there was a tendency for the thoracic spine to extend and the lumbar spine to flex. At the midpoint of the thoracolumbar junction there were increases in both flexion and extension, so the spine started to describe a more pronounced S-curve as water depth increased. “Promoting flexion in the lumbar spine has benefits for nearly all sport horses, but the consequences of producing extension in the thoracic spine need to be considered, particularly if you’re using the water treadmill to rehab a horse with over-riding dorsal spinous processes as these most often occur between T13 and T18. “Water around hock depth gives us a happy medium in terms of promoting flexion of the back, and promoting flexion is a common treatment goal, particularly in cases recovering from over-riding dorsal spinous processes. “You still get lumbar flexion but there is less marked thoracic extension, maybe because at this depth horses are still able to lower the head and neck. The Equine Therapy Centre at Hartpury offers treatment and rehabilitation of musculoskeletal conditions using a combination of up to date facilities, physical therapy and techniques in veterinary medicine. International Survey of Equine Water Treadmills – Why, When and How? Journal of Equine Veterinary Science.